As one of the most prominent video game publications in the world, it wouldn’t seem like IGN has any reason to steal its content, but an accusation of plagiarism coming from a YouTuber today seems to be pretty damning. As Nintendo Enthusiast reports, YouTuber Boomstick Gaming has presented his evidence in the form of a side-by-side comparison video that shows his own review of Nintendo Switch action-platformer Dead Cells, and an equivalent IGN review that not only runs for a similar link, but which allegedly takes (at the very least) extreme inspiration from his own. 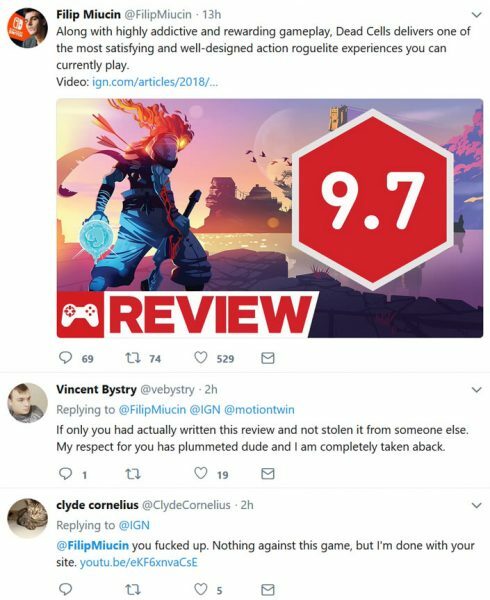 “I published my Dead Cells review last week and today IGN put out their written and video reviews today,” he writes in the video description. “It’s kind of flattering but the gentlemen doing the review 100% had my video up on his computer while he was “writing” his review for Dead Cells and copied from a lot of my script. It didn’t take long for him to find out, with IGN pulling the review – filed by Editor Filip Miucin – as they investigate the issue, although his Twitter post remains live, attracting plenty of ire from a community who have seemingly made their judgment already. The similarity of the wording certainly does seem damning, with full sentences appearing to have been either copied outright, or have been changed ‘just enough’, with a word or two being swapped out. 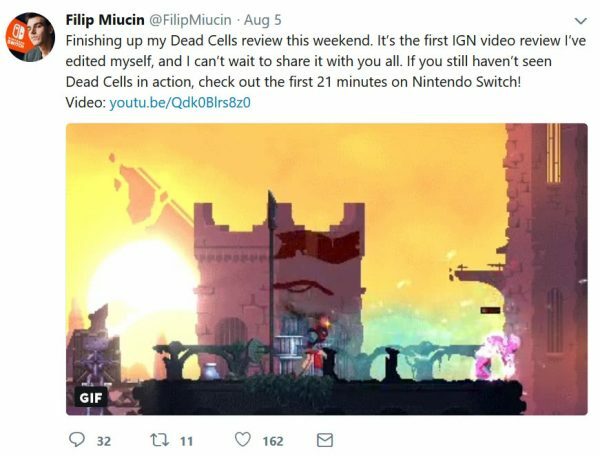 It’s important to note, however, that while Miucin seemingly produced the video, the script may have been written by another member of the team, or even a freelance reviewer – although he did earlier claim that it was “the first IGN video review I’ve edited myself”, and describe the review as “my Dead Cells review”, apparently taking ownership of its contents in their entirety. We’ve reached out to Miucin for comment, but will have to wait and see what his company’s final verdict is to understand exactly what’s happened here.